WE'RE EXCITED TO TELL YOU MORE ABOUT MEMBERSHIP AT EQUINOX. FIRST, LET US KNOW WHO THE MEMBERSHIP IS FOR. Personal Email PLEASE ENTER YOUR PERSONAL EMAIL ADDRESS. WE USE IT TO STAY IN TOUCH WITH YOU IF YOU BECOME A MEMBER. PLEASE COMPLETE THE FIELDS BELOW FOR THE FAMILY MEMBER YOU ARE SPONSORING. Email PLEASE ENTER YOUR PERSONAL EMAIL ADDRESS. WE USE IT TO STAY IN TOUCH WITH YOU IF YOU BECOME A MEMBER. 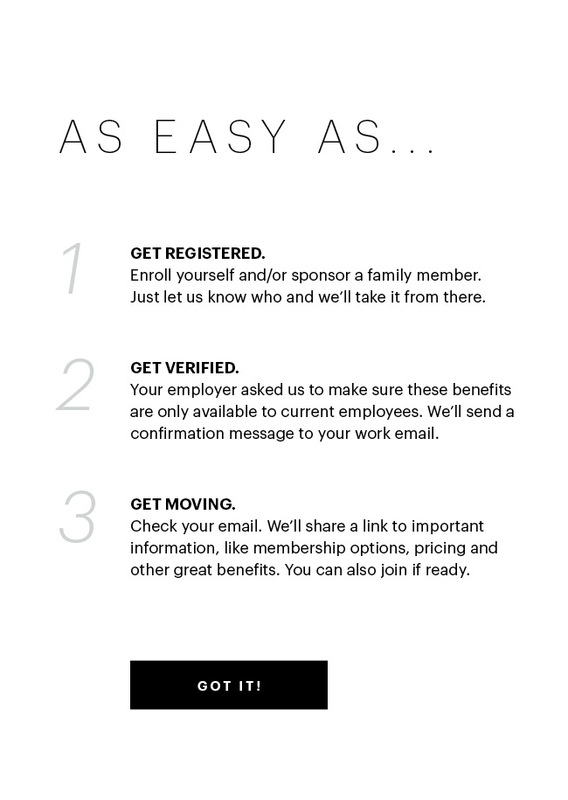 We just need to know a few details about the employee sponsoring the membership before sharing more details of the benefit. Work Email PLEASE ENTER YOUR WORK EMAIL ADDRESS. A Membership Advisor will reach out to you shortly. What membership options are available? What is included? First, please complete the enrollment form. We’ll send you a link that you can use to view the membership and pricing options available to you. • A one hour Equifit assessment. It will show you where to focus to maximize your results. • A complimentary one hour session with one of our expert trainers. • A complimentary one-on-one Pilates session. • Locker rooms stocked with Kiehl’s products, full size lockers and all the amenities you need to get ready for wherever life takes you after your workout. • Give our Spa Services and curated line of Fitness Apparel a test drive with 20% discounts on your first purchase. • Two day passes to share with guests of your choice. • Equinox members also receive a 10% discount on all Spa services. • Regional, All Access Fitness, Destination and Executive Access memberships allow you to workout at multiple clubs. Why do I have to give you my information before seeing my options? Can I call someone instead? Our corporate partners ask that we keep their terms confidential and only share them with active employees. To validate your employment, we just need your employer-issued email address then we’ll send you a link to all the information you need. However, if you would like a member of our team to contact you, just click Request More Info and complete the form. We’ll get back to you right away! Do I have to tell my employer I enrolled? We have a great relationship with our corporate partners and can provide them a list of participating employees anytime they need it. This means you don’t have to do anything! Can I extend the same benefit to a family member? Each company has their own rules about whether family add-ons are allowed and the number that can be added. If your company allows add-ons, just follow the same process you would for yourself. 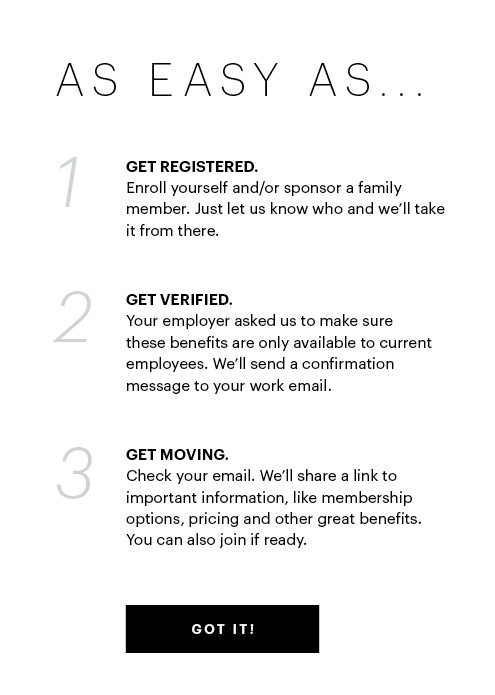 Simply indicate that the membership is for a family member, complete the form using your employer-issued email address, and we’ll send you a link to get them started. If you have any questions along the way, you can email us at support@equinox.com - we’ve got your back. Do I have to be a member to enroll a family member? No, but you must remain an active employee for your family member to retain the special corporate rate. Yes, you can freeze your membership. Does my employer offer a subsidy? How do I claim it? Your benefits department can confirm if there are any subsidies for wellness program participants. If your employer has notified us of the subsidy, we’ve highlighted it in the pricing section of the enrollment process. Why do you require both my employer-issued and personal email addresses? We use your employer-issued email address to validate that you are an active employee. Your personal email address helps us keep you in the know should you ever switch employers. We’ll communicate special offers and service announcements as well as send any receipts for purchases to your personal email address. You can opt-out of the emails anytime. What happens after I enroll? How do I get access to the club? Your membership is active as soon as you complete the enrollment process. We’ll e-mail a copy of the membership agreement receipt. To get started, simply stop by the Front Desk of your preferred club. Our Associates can help you get started with the Equinox App, which allows you to check-in, browse classes, book studio cycling bikes and track your workouts. If digital check-in isn’t for you or you have an Android device, we have alternatives for you. If you switch jobs, the preferred rate with your old employer will end for you and any family add-ons after your first anniversary; the memberships will be reverted to the standard plan available for that membership type. We’ll send you at least 30 days notification so you’re always aware of your rate and can make the decision that’s right for you. If your new employer is a participant in our corporate program, simply follow the same enrollment process to transfer your membership to your new employer’s corporate plan. If you wish to cancel your membership, please contact the General Manager of your preferred club. You can find the General Manager’s phone number listed by club here.